This is one of the three remaining poles serving as power supply support, which belonged to Pula’s one-time electric tram. At the beginning of the 20th century, when Pula was the main naval base of the Austro-Hungarian Navy, a modern European cosmopolitan city of that time developed as a result of industrialization and flourishing technological development. At the beginning of 1904 the first power station was constructed and the tramway infrastructure was completed. All this was realized owing mostly to industrialist J. L. Munz, who also constructed the magnificent villas on this street. The trial run was completed on March 24, 1904 and on the first day there were 6 500 passenger trips. In the following months, there were as many as 100 000 passengers a month. 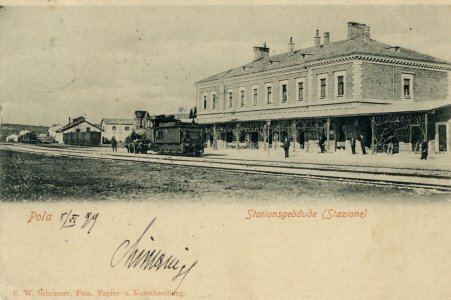 The total length of the tracks, from this station to the last one near Kaiserwald (Imperial Forest), was seven kilometers and there was a plan of extending the tracks to Fažana and Vodnjan, which was never realized. An interesting fact related to the Pula tram is that its track gauge was the same as that of the train, which enabled shared tracks. After World War I trams slowly began to lose their importance because of the strong competition they had to face with buses. The last tram ride was on June 16, 1934 after which the tram line was closed. According to some information, the Italian army tried to dismantle it and, together with the tracks, transport it to Ethiopia, although there is no certain evidence to prove such an attempt. Apart from a few photographs and collective memory, the only remaining things are these three poles, several metal hooks fastened on the facades and segment of the tracks along the coast. Such recollections of an epoch in the history of Pula are an important bond for all of us, and imperative for the possibilities of its revalorization. The Austro-Hungarian Empire ensured land routes that connected Pula to the rest of the world. Before the arrival of the railway in 1876, the delivery of goods and transport was done using maritime routes, while the macadam road was reserved exclusively for mail coach service. The arrival of the railway in Pula led to increased efficiency, especially in shipbuilding and naval industry, as well as the city’s construction development. In just a few years, completely new neighborhoods were built, and after two years the railway was connected to the Arsenal. That railway operates occasionally even today. The essential foodstuffs were also transported by rail. At the beginning of World War I, one of the most commonly transported food products was beer. This is not surprising, because at that time Pula had a population of 100 000, many of whom were soldiers. Parts of hydroplanes were also transported by rail, which were then assembled on Katarina Island and used at the surrounding air stations. Submarines were also transported from Germany. On several occasions, Pula’s railway station welcomed Emperor Franz Joseph and his beloved Sissi, as well as other members of the royal family. Several old locomotives managed to survive the last century and now evoke images of the past, a beautiful era of our civilization. Also, this magnificent building stands as proof of all those events, something we should honor in order to better understand human development.